Gina M. Euell has over 30 years of experience in the trade show and graphics industry. She started Exhibit Solutions of New Mexico, Inc. in April of 1999. 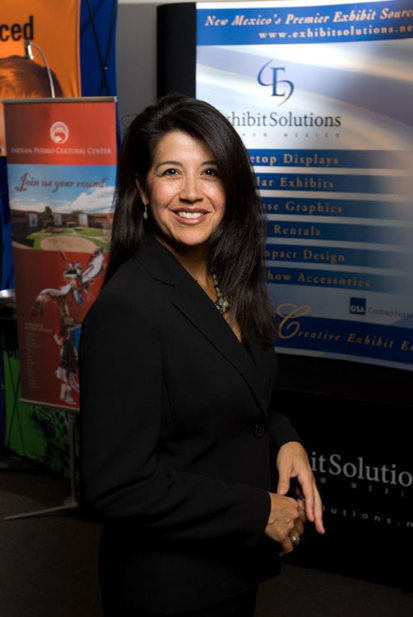 Exhibit Solutions is a Native American, woman-owned small business offering portable trade show displays, exhibits, visual marketing products, in-house large format graphic printing and design. Gina is active in various memberships including the American Indian Chamber of Commerce, Greater Albuquerque Chamber of Commerce, and the NM 8(a) & Minority Business Association. In November 1999, Gina was awarded the Executive Director’s “Advocate of the Year” Award and in November 2000 awarded the “Volunteer of the Year” from the Rio Grande Minority Purchasing Council. Gina was named one of New Mexico’s Top 100 Power Brokers in 2000 from the New Mexico Business Weekly. Exhibit Solutions was awarded the Albuquerque Hispano Chamber of Commerce “Outstanding Business of the Year” award in 2005. Gina Euell received the “2006 American Indian Entrepreneurial Leadership Award" from the American Indian Business Association . Exhibit Solutions has been listed as one of the Top Small Diversity Businesses in New Mexico from DiversityBusiness.com and Top Women-Owned Businesses, Top Native American-Owned Businesses and Fast Trackers Award (Small Business) from the NM Business Weekly. In 2008, she was honored with the Minority Business Development Association's Regional Director's Award. She was awarded the 2009 "Women at Work" award for being one of New Mexico's top women owned businesses. In 2012, she was named as the New Mexico State Business Person of the Year by the Small Business Adminstration (SBA). Gina served as a board member for the Greater Albuquerque Chamber of Commerce from July 2001 to 2009 and on the Small Business Development Center Advisory Board. She has served as Vice Chair for the Greater Albuquerque Chamber of Commerce Small Business and Entrepreneurism Division and on the Executive Board of Directors. She is the former Chair Person for the American Indian Chamber of Commerce and currently serves on the CNM Foundation Board of Directors.